The Biomedical Engineering Research Group (BERG) at the University of Stellenbosch, South Africa is involved in research regarding stented aortic valves for percutaneous implantation. The use of dynamic numerical simulation aids researchers in better understanding valve dynamics and speeds up the prosthetic valve design process. The aortic valve is a complex structure and there is a constant need for flow and stress data to support the design of a prosthetic valve in the absence of viable measurement methods. At the University of Stellenbosch MSC Software is used to study aortic valve behavior. In particular Dytran is used to simulate the Fluid Structure Interaction (FSI) between the valve and surrounding blood as part of a thesis. Dytran FSI simulations enable researchers to accurately study and experiment with different valve designs without the need to build prototype valves. The explicit formulation of Dytran makes it perfect for simulating the rapid non-linear deformation of an aortic valve. A full valve cycle is usually in the order of 0.2 ms. Figure 1 shows 2/3 of an aortic valve after it has been meshed with MD.Patran. 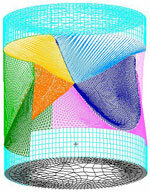 The prototype CAD geometry is imported into MD.Patran where it is meshed and additional closed volume geometry required by the FSI solver is created. A typical valve will consist of four "closed volumes" each with an Euler domain assigned to it. The Euler domains are then coupled to each other through porous dummy elements. The leaflet material behaves non-linearly and is entered as true stress-strain curves. Pressure data from a pulse duplicator is used as boundary conditions for one of the Euler domains to accurately simulate the cardiac cycle. Figures 3 and 4 are examples of typical simulation results after post-processing in CEI.Ensight. The accuracy of the simulations are compared to high speed images from prototype valves tested in a pulse duplicator. Figure 2 is an example of such a comparison. Other parameters used for validation include pressure curves, flow curves, Rapid Valve Opening Time (RVOT), Rapid Valve Closing Time (RVCT) and Ejection Time (ET). The extensive material and shell formulations available in Marc allow researches to investigate the effect material properties have on valve performance. Especially material with a non-linear orthotropic behavior, as is often the case with Bio-Materials, can accurately be modeled with Marc subroutines. Figure 5 is an example of a structure only simulation with Marc.